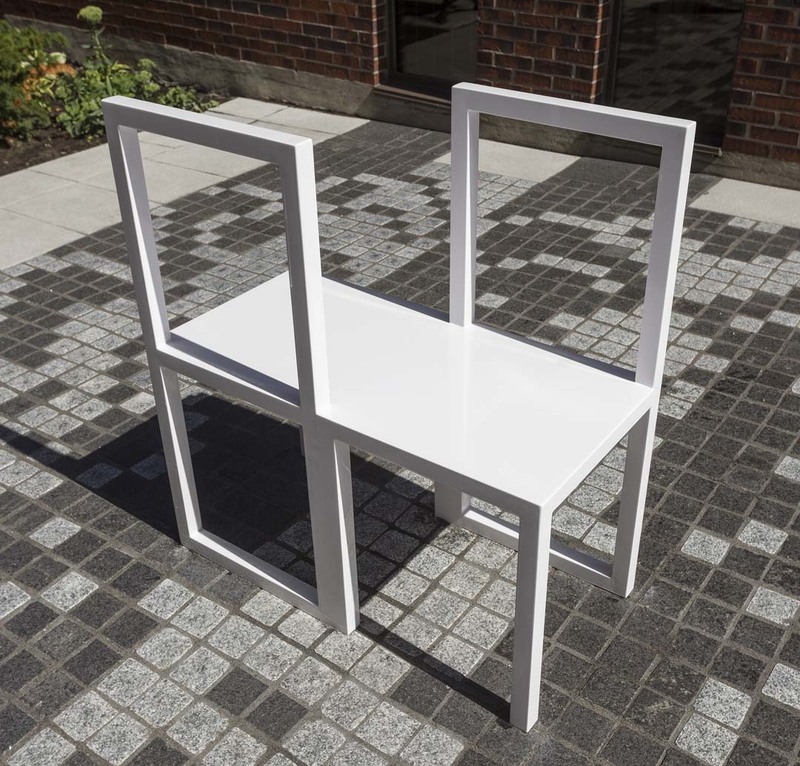 Kate & Nora takes up the motif of the confidant in a previous work by Robert Wilson, Bessie Smith Breakfast Chair, an armchair that is big enough for two people to sit side by side facing different directions. 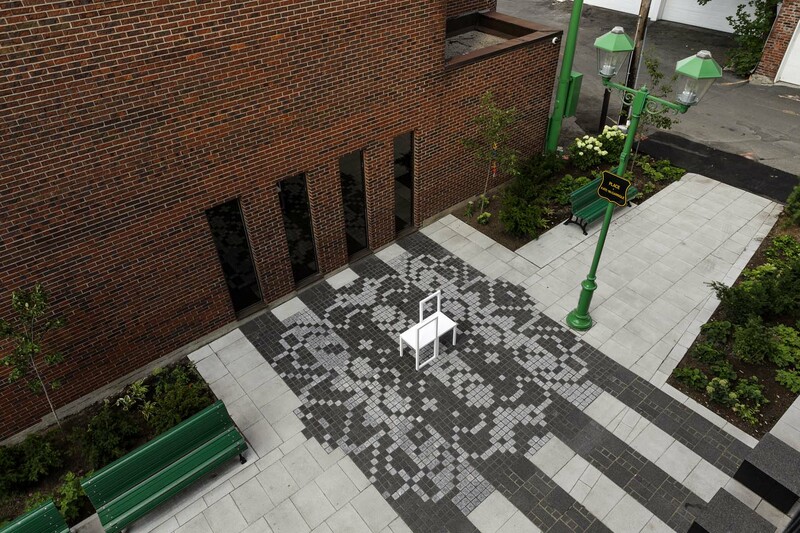 The artwork is described as two symmetrical white chairs, linked by a single seat. Its shape is characterized by the rectangular figures defined by right angles and by the alternation of positive and negative spaces. Kate McGarrigle (1946–2010) was a folksinger in English and French with her sister Anna for more than four decades. 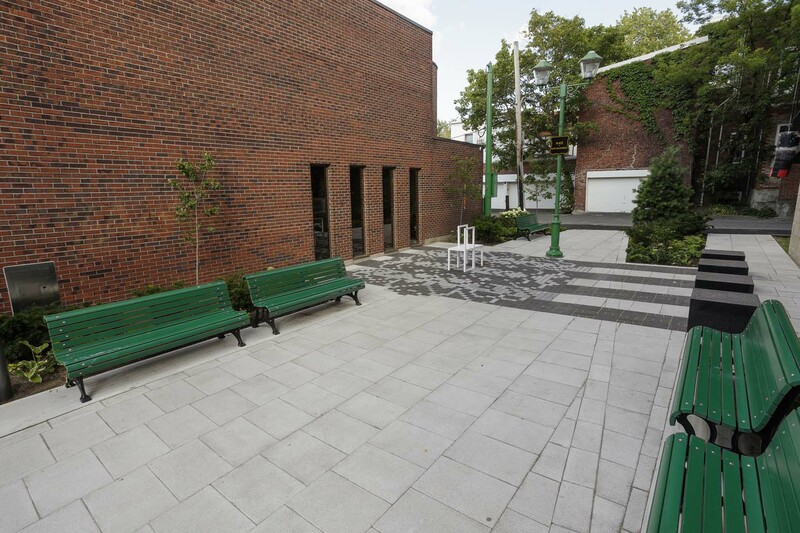 To commemorate her, in December 2012 Robert Wilson, Rufus and Martha Wainwright, and the Fonds Kate McGarrigle of the Fondation du CUSM submitted a proposal for the donation of an artwork to the Ville de Montréal to be situated in the square that now bears her name. As its title suggests, the artwork is a tribute to author–songwriter–performer Kate McGarrigle, who lived in the borough. Nora, the other female character in the sculpture’s title, is Kate’s alter ego, who followed her since childhood and embodied her wiser side. Kate McGarrigle is also commemorated by the place name of the square where the artwork is installed. A mosaic floral motif made of mosaic is inlaid in the ground around the work, integrating it with the landscape like a carpet that enhances a domestic space. Multidisciplinary artist Robert Wilson has been known internationally since the 1960s for his set designs and directing as much as for his paintings and sculptures. Among his remarkable achievements are the direction of Philip Glass’s opera Einstein on the Beach (1976), which gained him worldwide fame. In 1993, he received the Lion d’or for sculpture at the Venice Biennale. Retrospectives of his work have been presented at Centre Georges-Pompidou and the Boston Museum of Fine Arts. Wilson is recognized for his work in furniture, both sculptural and scenographic in nature.